The weather has been fantastic the last three days, at least in my view. After the cold front knocked the temps back down to the more normal range, we’ve enjoyed highs in the mid 60s to mid 70s during the day with low humidity (low humidity is rare here), so it has been perfect hiking weather. 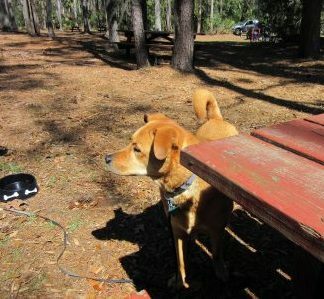 Yesterday, the three of us spent most of the day exploring two of Georgia’s state parks in the southeast portion of the state: Skidaway and Fort McAllister. Like in Florida, there are fees to enter the state park system locations. For state parks like these, the cost is $5 per day per car (with up to 6 people); however, you can enter more than one park on the same day for the one fee. Annual passes can be purchased for $50 (per person, I believe). Historic Sites, like Fort King George, have a different fee. Adult entry is $7.50 to the historic sites, and annual passes are also available for purchase. The really cool thing I learned is that there is a program in Georgia that exempts anyone who has a valid Georgia library card from paying these fees. You can read about this program here. We made the most out of our $5 entry fee yesterday, spending time in Skidaway and Fort McAllister, which are not too far apart. Most of our time was spent in Skidaway, and we loved it. Our son Nathaniel told us this park was very nice; we just never made it to the park while visiting them when they lived in Savannah while attending graduate school. Today, we did make it. Skidaway SP, just a short drive from Savannah, Georgia, is beautiful. Picnic and hiking opportunities abound. 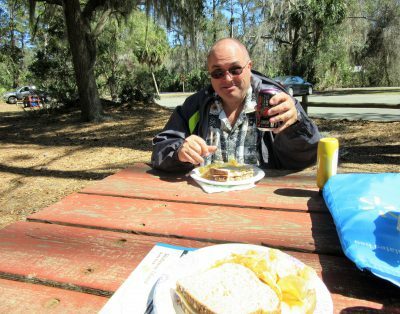 Jim, Chewie, and I had a picnic in the park before hiking two of the trails: Sandpiper Nature Trail and Avian Loop Trail. Chewie is ready to hit the trails; he sees others on them. As we made our way to the first trail, we passed some really interesting and appealing things in the park: an awesome adult outside exercise set up and a nice kids play area. Jim had to try out both. Finally, we got to the trailhead. 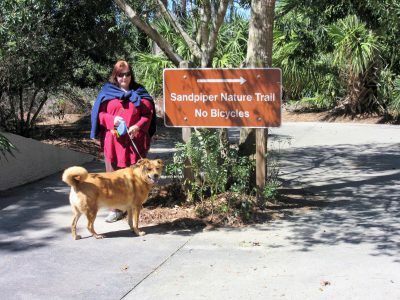 The first of the two trails we hiked at Skidaway SP was Sandpiper Nature Trail. The second trail, Avian Loop Trail, was picked up at the back end of Sandpiper. A small portion of Sandpiper Nature Trail was closed due to damaged received by Hurricane Matthew last October. With the breeze coming off the water, we needed our jackets part of the day. Markers along the trails coordinate with information on the trail map brochure that explains what you are seeing. When closer to the river, the vegetation at times was so thick that we felt as if we were walking in a jungle. Several people were hiking the trails, but it was not crowded. Chewie got to meet a few dogs along the trail, too. All were friendly except a couple of yappy dogs who were together that didn’t seem to get along with any of the other canines. They barked at Chewie twice, and we could hear them barking at other dogs off and on. Below are pictures from our hike. Click on the pictures, or hover the cursor over the pictures, to see captions. This is a good climbing tree (I cut out the kids climbing). I felt like a jungle in this area – hard to tell from one picture. A boat passes as we reach the river. Chewie was disappointed; this is NOT spring water. We enjoyed our time at Skidaway, but our day was not done yet. The three of us headed for Fort McAllister SP, about a half an hour away. Per my request, we made a stop between parks, so upon our arrival at Fort McAllister, we knew we did not have time to walk either of the trails we’d hoped to hike, but we did get to walk around a bit. Part of the park was roped off due to Hurricane Matthew damage. The campground was gated; it is posted as as full. Since we had Chewie, we could not go into the museum. Below is a quote about the park found on the park’s website here that gives you an idea of the historical significance. We did enjoy the views as we wandered around, and all of us climbed the observation tower. Pictures of our time there are below. You know the caption drill. I never knew there was a CSS Nashville. We returned to the RV tired but satisfied. It was a great day to be outside.